We are loving sushi class! Each class builds on the next beginning with a review of the lessons of the previous week followed by the introduction of new concepts and techniques. 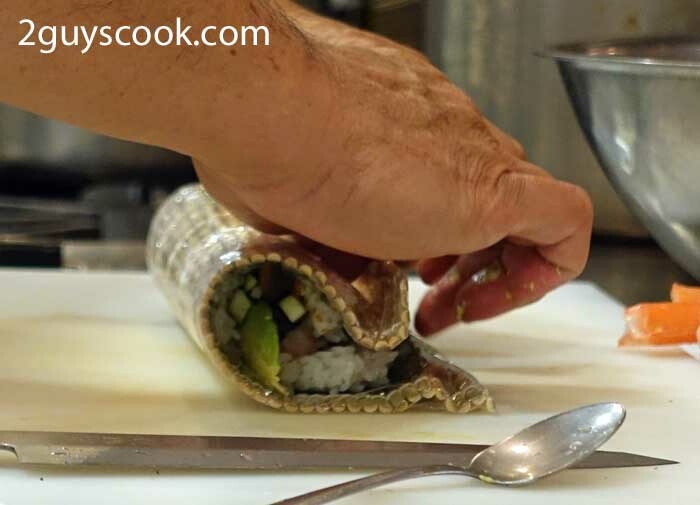 This week we were introduced to creating sushi rolls. 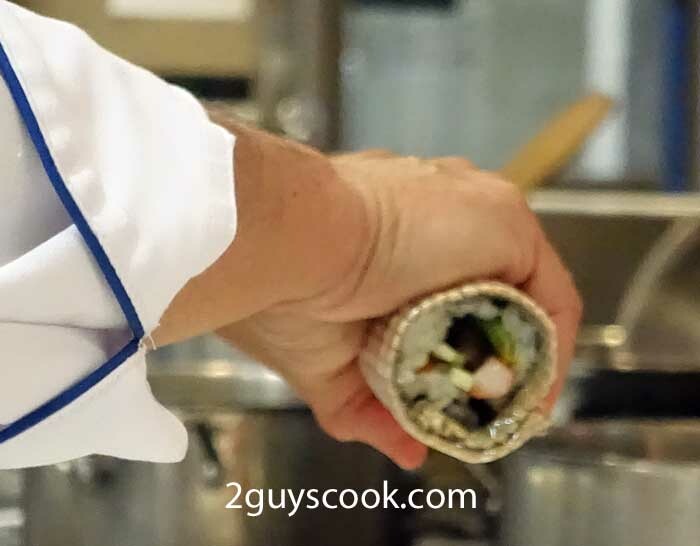 Specifically, we learned to make futomaki, the largest (and easiest) sushi roll. 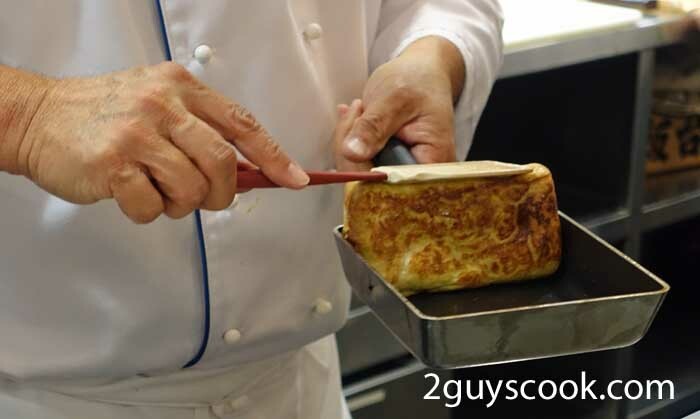 We also learned how to prepare shitaki mushrooms and tamagoyaki, a sweet rolled Japanese omelette. Dried shitake mushrooms are first rehydrated in cold water. 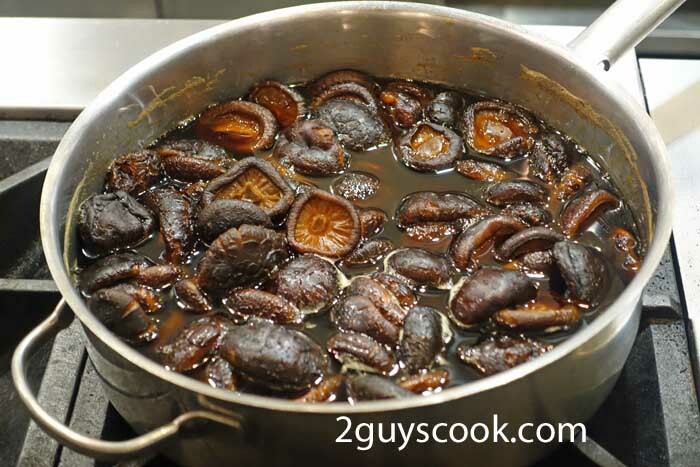 They are then poached in a solution of the rehydration water, soy sauce and sugar. After cooling they are sliced in order to add them to the sushi roll. To make a Japanese omelette, flavouring is added to beaten eggs. Both sweet (mirin, sugar, maple syrup…) and salty (soy sauce, dashi…) can be added. 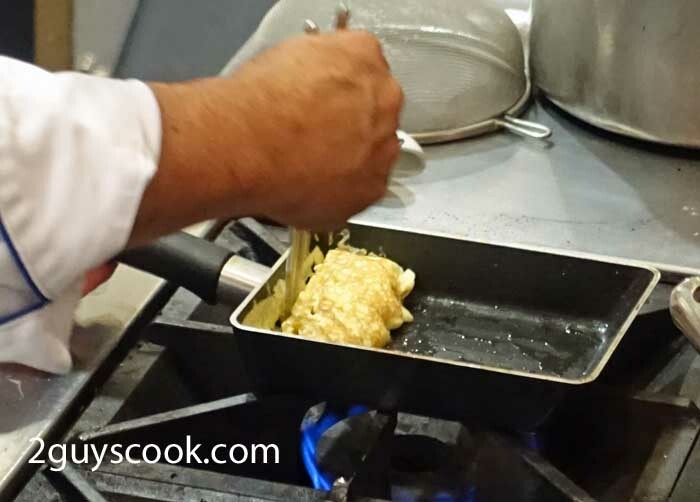 The egg is placed into a preheated pan. 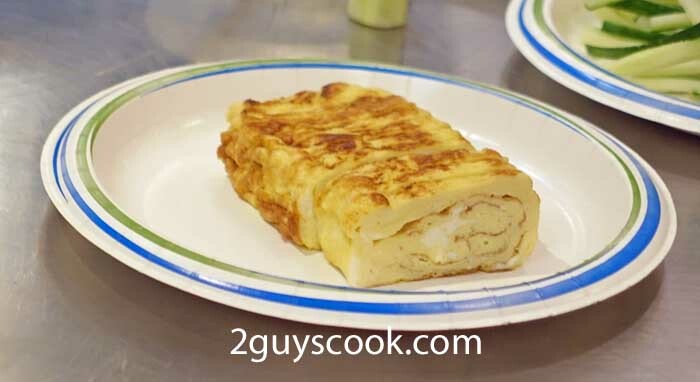 A nonstick tamagoyaki pan is shown above. After beginning to coagulate, chopsticks are used to fold the egg back on itself (starting at the front and moving towards the back of the pan). 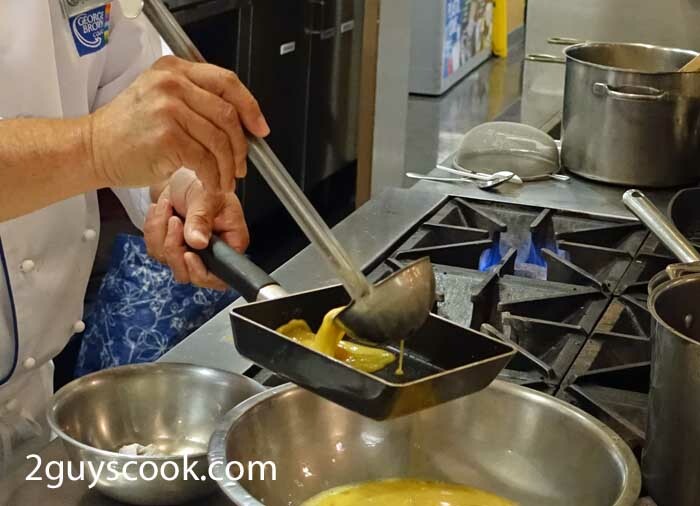 When complete, the cooked egg is then slid to the front of the pan and more liquid egg is added. The procedure is repeated over and over until the omelette is the same size as the depth of the pan. 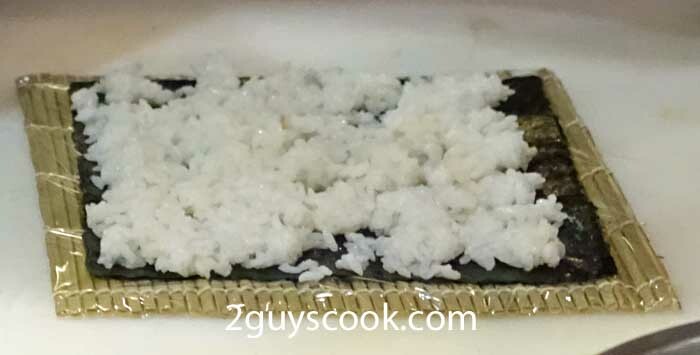 After making sushi vinegar and sushi rice, a sheet of roasted nori was put on a plastic wrapped bamboo mat. Rice was spread on the nori, leaving a small free edge in the front. Fillings are then laid across the back end of the rice. 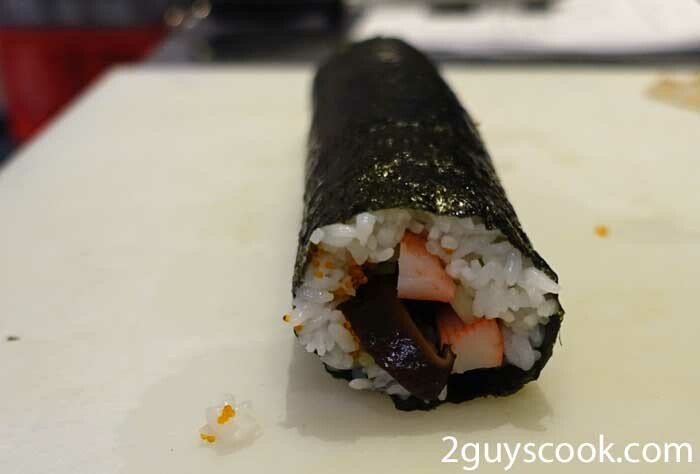 We used tobiko (fish roe), cucumber, shitake mushrooms and surimi (imitation crab). 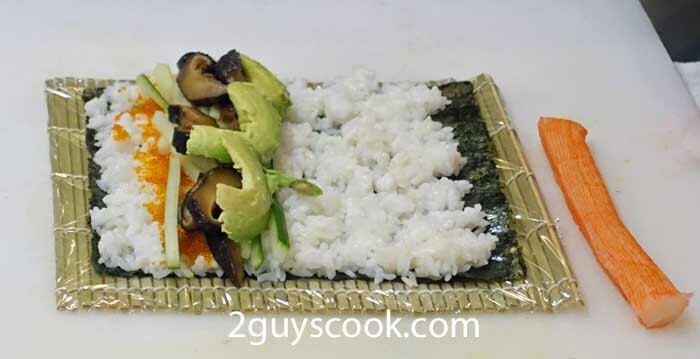 The sushi mat is used to form the roll and it is gently squeezed between your hands. The sushi knife is wet down and the roll is cut. This was our night’s haul. Not bad for a first try!! It looks great! 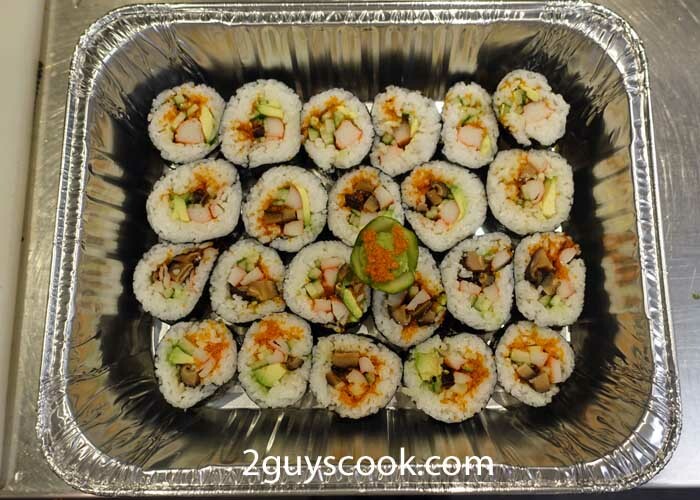 This is the sushi my mom used to make for New Year’s Day. Only she would use an odd number of ingredients as even numbers are considered unlucky. The number 4 is especially bad luck as it is “shi” which is death in Japanese. 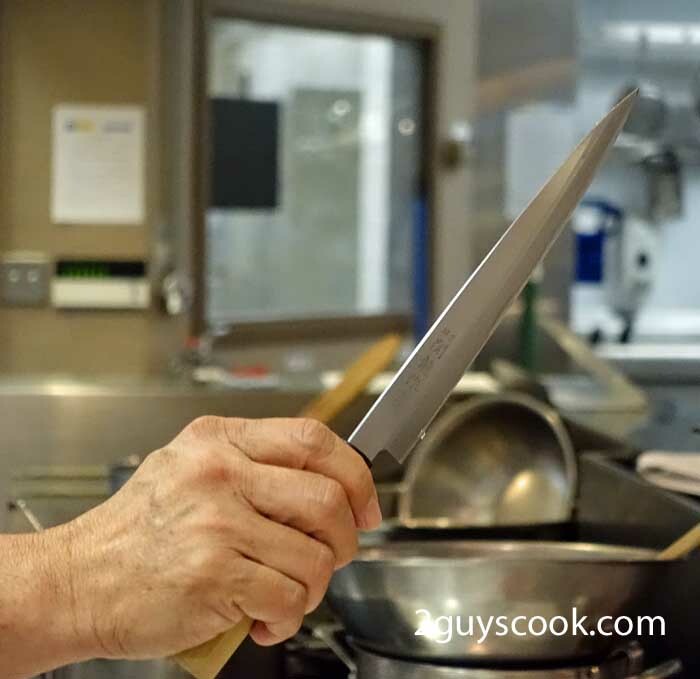 She usually used 5-7 ingredients, 7 is a very lucky number. Steamed spinach, thin sliced red ginger, marinated eel, kanpyo (marinated gourd) and strips of scrambled seasoned egg. Thank you for your comment! I will make sure that I use an odd number of ingredients and am definitely going to try get 7 ingredients in next time.